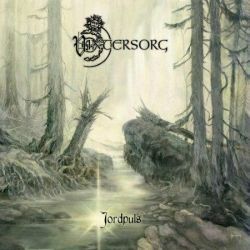 Sweden's Vintersorg, led by the prolific Borknagar frontman Andreas Hedlund, is renowned for delivering genre-defying albums that capitalize on a skillful combination of folk music, black metal, and progressive rock. Four years since Vintersorg's last album, which received mixed reviews from the metal community, Hedlund is back with Jordpuls - an album that will easily make its way into my Top Ten list for 2011. Jordpuls is one of those releases that is so full of subtleties and nuance that it's practically impossible to write a concise review that would even begin to do the album justice. Aggressive black metal elements intertwine with progressive tendencies in a truly symbiotic way, as folkish - even New Age - traits filter through at every twist and turn. Hedlund's harsh black metal rasps, which are less enjoyable than his clean singing, are used effectively only where appropriate. Jordpuls is instead dominated by layered crooning, which reminds me a bit of Heri Joensen of Týr, and an almost '70s AOR style of vocal harmonies. This may put off purist black metal fans, but will almost certainly enrapture fans of more melodic forms of heavy metal. The choruses of "Världsalltets Fanfar" and "Klippor Och Skär" are irresistable, as are the sweeping harmonies of "Mörk Nebulosa". The skillful guitar work of Mattias Marklund, the only other full-time member of Vintersorg, is also impressive as complex prog riffs dissolve into pure tremolo fury before fading away in an acoustic haze. Much of Marklund's riffing is bolstered by a strong keyboard/synth presence, creating moments that are often majestic and always memorable. Such interplay is most exemplified on "Klippor Och Skär", one of Jordpuls' most progressive and expressive tracks, and on the outstanding "Palissader", which is the song that I feel best blends the aggression, melody, atmosphere and grit that Vintersorg is known for. Other outstanding tracks include "Till Dånet Av Forsar Och Fall" and the mellow "Eld Och Lågor", with its remarkably expressive solo. As enjoyable as it is, Jordpuls does have faults. The programmed drums aren't necessarily notable, and at times (such as on "Klippor Och Skär") sound rather flat. There is also an occasional over-reliance on progressive tendencies that derails the mood, but that probably has more to do with my personal feelings towards the style than any songwriting missteps. Those two very minor gripes aside, Jordpuls is an album that effectively conveys the beauty and fury of our natural world - topics at the core of Hedlund's creativity. I've spun this album numerous times and still find little quirks that escaped previous listenings. To fully appreciate Jorpduls, it quite simply must be listened to.